Thrive is a book I want to send to every teacher I know. I want every teacher education department to give it to their teacher babies. I want to hand it out at every PD session I attend. It’s just that amazing. It’s a tough time to be a teacher. We all see it and sometimes it’s hard not to feel beaten down. But Meenoo’s book is a bright light in the darkness. She learned early in her career that teaching can be a lonely career if you don’t reach out to the community around you. In Thrive she shares the strategies that she uses in her professional life and the ways that teachers can apply them to their own. I’ve seen this firsthand through Twitter and Meenoo was one of the first teachers who reached out and walked me through community-building on the network. When I stumbled upon #engchat I knew I had found one of my tribes and I’ve been a fixture in the chat ever since. There are days when my Twitter PLN keeps me sane and I’m so glad Meenoo has captured the importance of that community in her book. But it’s not all about social media. No! 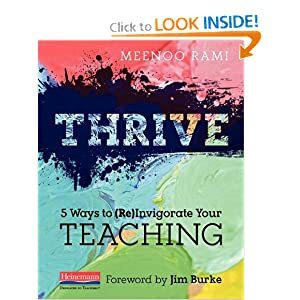 Meenoo shares ways that teachers can reach out to colleagues in their departments, their buildings, their local and national professional organizations, and much more. Teaching is a profession that works best when we mentor others and allows ourselves to be mentored. Thrive is perfect for first-year teachers who are just entering this crazy world of education, and it’s also the rejuvenating spark that veteran teachers need! We should be reaching out and helping our colleagues while also recognizing that teachers are life-long learners who can learn from their colleagues and students. Thrive will help you (re)discover the joy in teaching. I can’t wait to give a copy to my student teacher. And my sister. And my best friend. I imagine Thrive sitting on the shelf next to Harry Wong’s First Days of School and other vital teaching resources. It’s that important. Be sure to pick up a copy today! Make sure you are following Meenoo on Twitter because she is always sharing ideas and inspiration. And check out her blog! Be sure to check out some of the other stops on the Thrive blog tour! Yesterday: Kira Baker Doyle at Kira J Baker-Doyle, Ph.D.
Meenoo Rami is a National Board Certified Teacher who teaches her students English at the Science Leadership Academy in Philadelphia, PA. Mixing moments of joy, laughter, risk and encouragement, Meenoo pushes her students to think critically about their connection to the word and the world. Meenoo did her undergraduate work at Bradley University in Illinois in areas of Philosophy and English and completed her Master’s degree in Secondary Education at Temple University. 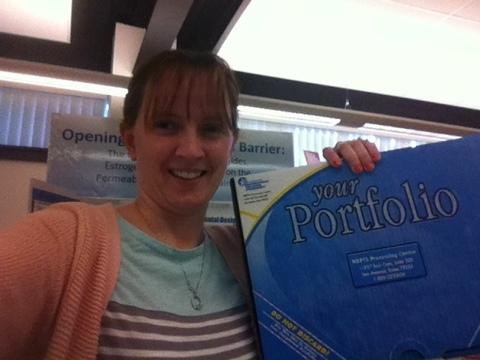 Meenoo also contributes to the work of school-wide events and professional learning communities at SLA. Meenoo works as a teacher-consultant for the Philadelphia Writing Project. 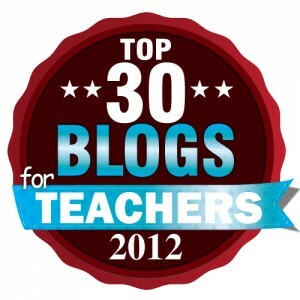 She has shared her classroom practice at various conferences such as: NCTE, ISTE, ASCD, EduCon, Urban Sites Conference for National Writing Project, and #140edu. Meenoo also runs a weekly twitter chat for English teachers called #engchat which brings together teachers from around the country to discuss ideas related to teaching of English. Her first book, THRIVE from Heinemann will be out in March 2014. In her free time, Meenoo can be found on her bike, on her yoga mat or in her kitchen tinkering with a vegetarian recipe. The best cross-curricular professional development I have ever been a part of was the Monarch Teacher Network’s “Teaching and Learning with Monarch Butterflies”. I first took the workshop back in 2006 and I still volunteer as a staff leader every summer. It’s fabulous and I can’t recommend it enough! Below you will find information about this summer’s workshops in the US and Canada. (Clicking on the link will take you directly to a registration form for that workshop). For more information or if there is no registration form available: contact: Brian Hayes at bhayes@eirc.org856-582-7000 x110 or write Monarch Teacher Network™ at EIRC – MTN, South Jersey Technology Park, 107 Gilbreth Parkway, Suite 200, Mullica Hill, NJ 08062. fax: 856-582-4206. It’s done! I mailed it! After months of writing entries, I finally finished. And I even mailed my box a few days early! Four Years Ago, I Was In Mexico…. Four years ago this month, I visited the monarch butterfly’s overwintering grounds in Michoacan, Mexico. Today, the same towns I visited are under attack from drug lords and gangs. It breaks my heart that travel restrictions prohibit other teachers from traveling there with the Monarch Teacher Network right now. To celebrate the beauty and magic of that trip, I wanted to link to the posts I shared after my trip. Join me in reminiscing by reading some of my updates from the trip, linked below. My trip to Mexico, and all of my dealings with the Monarch Teacher Network, made up some of the most powerful professional development I have ever participated in. I still act as staff at the annual summer workshops here in NJ and I hope to start traveling with some of the workshops in the next few years. Check out the website- if they are offering a workshop near you I highly recommend it. I’ve been home from NCTE for a few days now and I am still decompressing and reflecting. 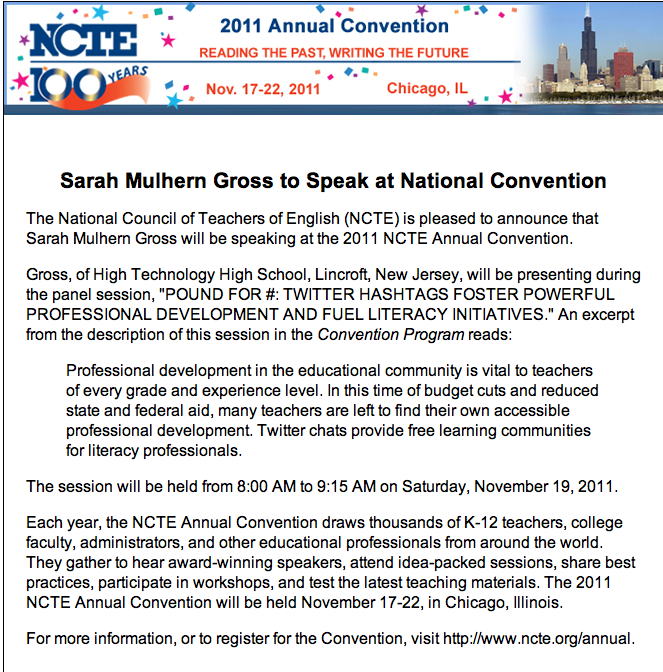 If you have the opportunity to attend NCTE’s annual convention you must go! It is the most powerful professional development I have ever experienced. 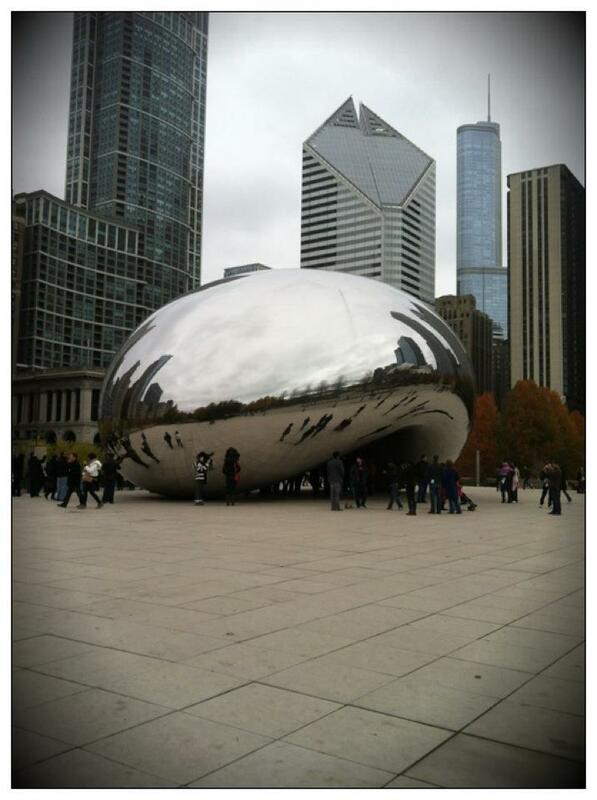 Chicago was my second NCTE and I am already planning for the 2012 convention. The PD is 24/7 at NCTE- whether at a session, in the exhibit hall, or just conversations over dinner. In fact, those conversations were some of the best PD I’ve had in recent memory. I had the opportunity to meet up with many of my Twitter friends and we talked about teaching, literacy, and so much more! My convention officially started Saturday morning at 8am. I woke up early to head over to the Palmer Hotel, where I was presenting with Donalyn Miller, Cindy Minnich, Colby Sharp, and Meeno Rami. 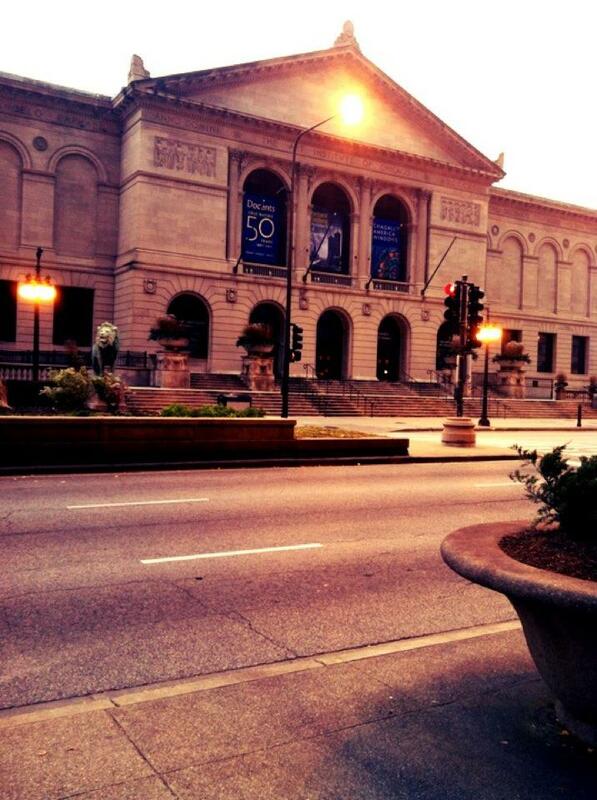 On my walk to the hotel, I passed the gorgeous Art Museum. Once at the hotel, I finally met all of my co-presenters face-to-face. I had sort of met Donalyn a few years ago at NCTE09, when she attended my session. But this would be my first time meeting everyone else. As I wandered the maze that was the 7th floor of the Palmer, I ran into Meeno, the amazing mind behind #engchat. She led me to the right room where I met everyone else. We had put the presentation together via Googledocs and twitter and I think we were all a little nervous about how it would gel together. Plus, with an 8am workshop, it’s hard to gauge how many people will show up. Well, we ended up with a great crowd and the presention, “Pound for #: Twitter Hashtags for Professional Development and Literacy Initiatives” was AWESOME. I am so lucky to have presented with such pros. We discussed #engchat, #bookaday, #titletalk, #ARCsFloatOn, and the basics behind hashtags and archiving. We also discussed community and met some of our favorite tweeters. I had so much fun and the time just flew by. We also had a back channel throughout the presentation (#4pound) with people both in and out of the room participating. It was a fantastic resource and really kept the conversation going. I also admit to doing some reading while my co-presenters were speaking. Cindy had brought a stuffed rabbit with her and placed it on the projector while she was explaining how to archive. She it #teamrabbit, you see. I knew that lately everyone had been talking about this picture book by Jon Klassen called I Want My Hat Back. Teaching HS, I don’t buy a lot of picture books so I hadn’t had a chance to read it yet. Lucky for me, Colby had brought his copy along and I borrowed it. First of all, I am #teambear all the way. But more importantly- BUY THIS BOOK. I already purchased a copy and read it to my freshman. I also plan to find a way to share it with my seniors (it only takes 5 minutes to read). It is not for the faint of heart and probably not for all average picture book readers. But it is my new favorite book. Get yourself a copy ASAP. After finishing up our presentation, Meeno and I raced back to the Hilton to attend a session about Chicago as a setting. The panel consisted of young adult authors John Green, David Levithan, Simone Elkeles, Jillian Larkin, and James Klise. The panel was great and I learned a lot about setting, revision, and general research when writing books. I took a lot of notes to share with my students, especially in reference to research. But the most amazing moment came at the end. John Green is a favorite of my students and also myself- his Looking for Alaska is the book responsible for bringing me back to YA literature. I promised my students that if the opportunity to arose, I would tell John Green that my nerdfighters said “hi!”. I made my way up to the panel and introduced myself to John Green. He was super-nice and shook my hand. He even said to tell my nerdfighters that he said hi. Needless to say- thrilling! I immediately updated our class Facebook page with the news and my kids were ecstatic. So thanks, John! After that, I went upstairs to my room to recharge my phone (a theme for the weekend) as I had been tweeting so much from the sessions. After a brief rest I headed down to the exhibit hall and picked up some ARCs. While down there I literally bumped into Jordan Sonnenblick, who I recognized from his Facebook profile picture. (#authorstalker). I introduced myself and we talked about some his books and how I used to read Drums, Girls, And Dangerous Pie aloud to my 6th graders, which led to a fantastic service project we put together for the children’s oncology hospital in a nearby town. Jordan was very gracious and let me know that he has YA novel coming out in the spring and I was able to snag myself an ARC at the Scholastic booth. I am so looking forward to read it! I wandered around for a few hours downstairs, talking to vendors and jotting down notes for my colleagues. When I passed the Chronicle booth at one point, I recognized the wonderful Kate Messner signing her books. I stopped to introduce myself and we were finally able to meet. Kate and I have been to the same conferences in the past but our schedules have never allowed us to meet face-to-face. Needless to say, she is a sweetheart and I was thrilled we were able to take some time to talk. After I finished up in the exhibit hall, I made my way to my last session of the day which focused on teaching The Canterbury Tales. I love Chaucer but it can be hit or miss with my students. The panel was fantastic as all of them had attended NEH’s summer experience in Canterbury. They shared many of their ideas and the experiences they have in their own classrooms. I took copious notes and walked out feeling re-invigorated about my choice to teach the tales. That night, Chris and I spent some time in downtown Chicago. I was determined to see the “bean” and I was not disappointed. It’s gorgeous! We also had our first experience with deep dish pizza, which was amaaaaazing. 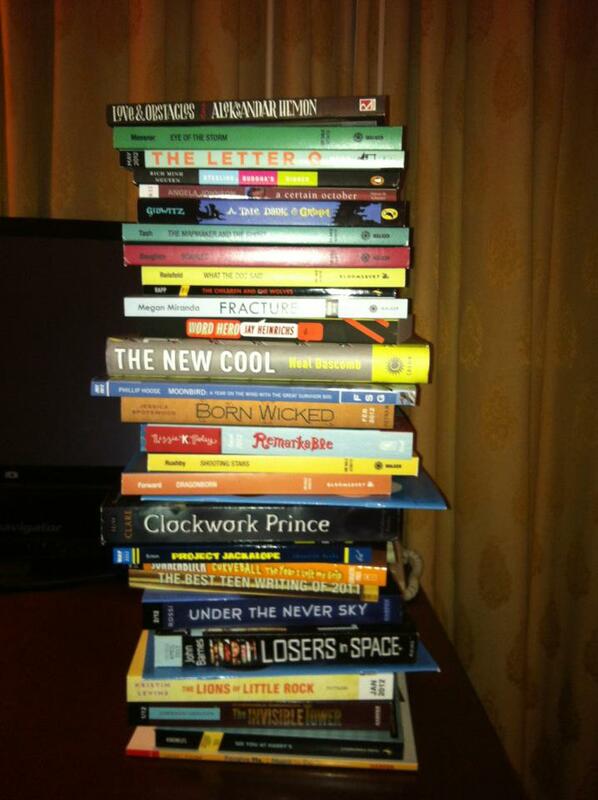 At the end of the night, I took a picture of my stack-o’-books and uploaded it to my class Facebook page. I wanted to make sure I stayed connected to my students even though I missed two days of school. The Facebook page allowed me to do so, while also letting them know what I was doing at the conference. Needless to say, I had a waiting list before I got back to my classroom! Day 1 of NCTE was unbelievable. I met some of my idols and listened to many of them share best practices from their own classrooms. I learned about writing from some of the best in the business. I spent time learning from my colleagues. I loved presenting with my panel and I was able to spread the word about #ARCsFloatOn. It was an amazing day. Look for my day 2 reflection in the next day or so! I will be presenting bright and early on Saturday morning, so come on out and see us! I will be with Donalyn Miller, Meeno Rami, Cynthia Minnich, and Colby Sharp. I am very excited about our panel. I know it’s early, but come on out to see us! Last night I participated in another great #titletalk on Twitter. The subject was personal and professional development this summer. Personally, I plan to read a lot this summer, putting a dent in my huge TBR pile/shelf. I also plan to write a lot this summer. But about halfway through the chat I remembered my favorite and most consistent form of professional development each summer- the Monarch Teacher Network! Tuesday was my last day at my summer job. Wednesday, Thursday, and Friday are devoted to my passion- the Monarch Teacher Network. As a former participant, I am now a volunteer staff member and the workshops are my favorite part of every summer. It never fails to completely inspire me and motivate me for the new school year. This year is no exception. There are about 60 participants, including 3 from New Zealand and 2 from Peru. At what other professional development workshop do you work with international teachers? AMAZING. The other participants are from NJ, Delaware, and Pennsylvania. It’s a whirlwind three days, and today was a flurry of activity. But it’s unbelievable just being able to share this amazing eperience with so many other extraordinary teachers! I left today feeling completely revitalized and energized, despite the 8 hour day and 2 hours of driving. Unbelievable. And I can not wait to continue the workshop tomorrow and Friday. Words can not describe what you see in the sanctuaries, and I wish that all my students could have the opportunity to see the magic takes place there. When you are here and you see, hear and feel the billions upon billions of monarchs, you are overwhelmed with the fact that we really are just a tiny part of this giant universe. It is a truly life-changing experience. Looking back at my pictures, video and words I realize that nothing can accurately describe the sanctuaries. The emotions that run through you as billions of Monarchs cling to the towering trees overhead and dance and play in a river of orange with a stunning blue sky behind them are indescribable. The Monarch Teacher Network has really changed my life. They are giving workshops all over the country this year and I will be helping out at the Mullica Hill, NJ workshop. You should really think about signing up! No workshop space will be held until a registration form is received. Click on the MTN registration form page to print and complete the registration form. There will be seven workshops in Canada in three Provinces including New Brunswick and Saskatchewan. If you are in NJ, you can attend the workshop for free! MTN has received a grant that will enable them to provide scholarships for the Monarch workshops, “Teaching and Learning with Monarch Butterflies” this summer. The grant money will allow them to pay all or most of the $99 registration fees for the workshops in New Jersey this summer. There are a limited number of scholarships available and it is first come first served so get the registrations in soon to qualify. Fill out the attached registration form, mark which workshop you would like to attend, and fax or mail the form to us at EIRC. All MTN Workshops 2011- New Jersey registration form.